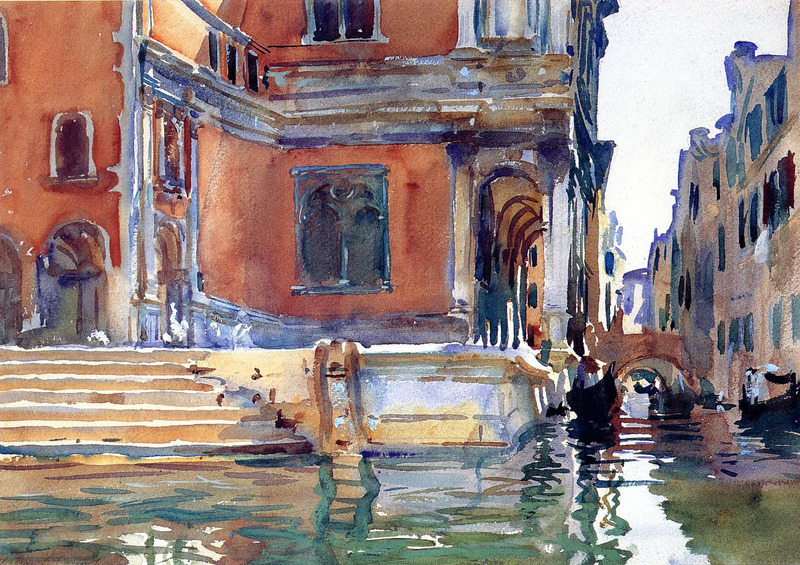 John Singer Sargent, Rio dell Angelo (1902), watercolour, 24.8 x 34.9 cm, Private collection. WikiArt. 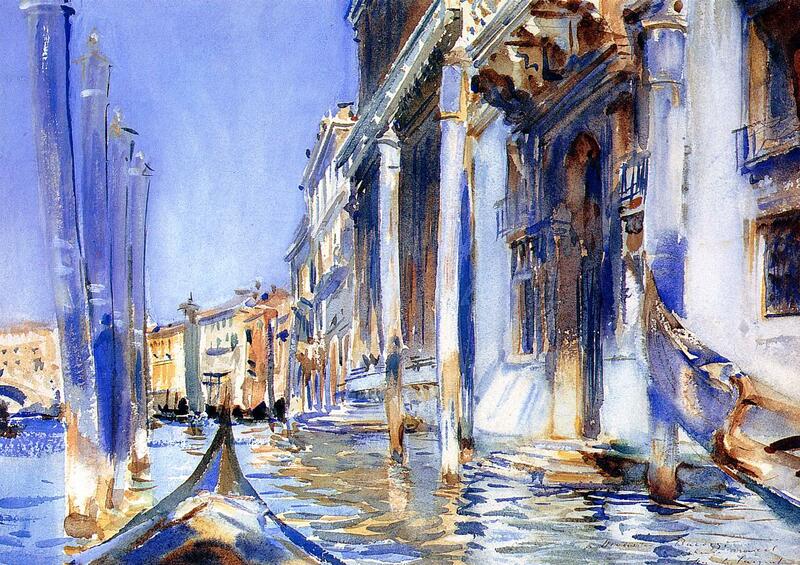 You may have gathered from my previous article on John Singer Sargent that I rather like his paintings. In fact he is my favourite American painter, and I think one of the greatest painters of all time. So I offer this article in recognition, for you to enjoy some of his works with me over the Fourth of July weekend, wherever you are. Born on 12 January 1856 in Florence, Italy, to expatriate American parents living in Europe, Sargent was educated at home and showed early skill in drawing. Already competent in watercolour at the age of 14, he saw many of the works of the great Masters during his family’s travels around Europe. In 1874 he succeeded in gaining admission to the École des Beaux-Arts in Paris, where he was taught mainly by Carolus-Duran, and less by Léon Bonnat. Although his initial enthusiasm was for landscapes, Carolus-Duran enthused him towards portraiture, and his first major portrait was admitted to the Salon in 1877. His clear talent was recognised by the critics, and he made friends with Julian Alden Weir, and Paul César Helleu, who in turn introduced him to other leading artists of the day, including Degas, Rodin, Monet, and Whistler. 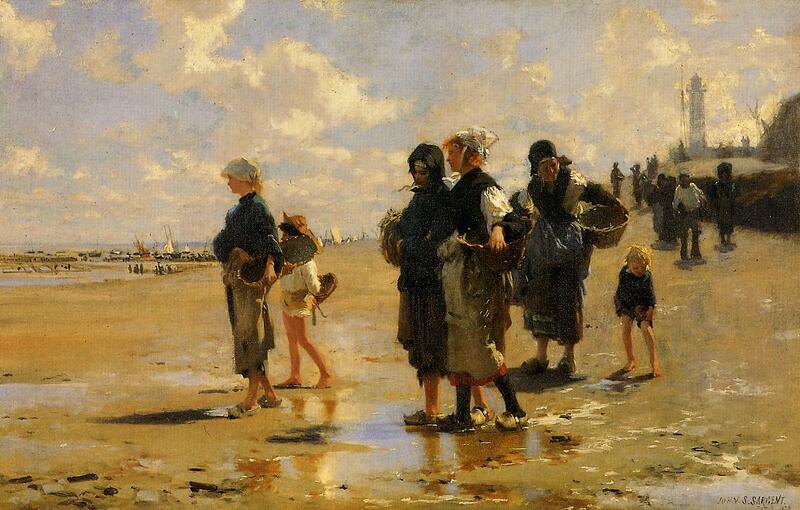 John Singer Sargent, Fishing for Oysters at Cançale (1878), oil on canvas, 41 x 61 cm, Museum of Fine Arts, Boston. WikiArt. His early style was realist, particularly in portraiture, but less formal works showed a subtle looseness in facture which was reminiscent of the Barbizon School or early Impressionism, but was quite distinct from the work of the leading Impressionists at that time. He started to travel throughout Europe, visiting Spain in 1879 to study the works of Velázquez. 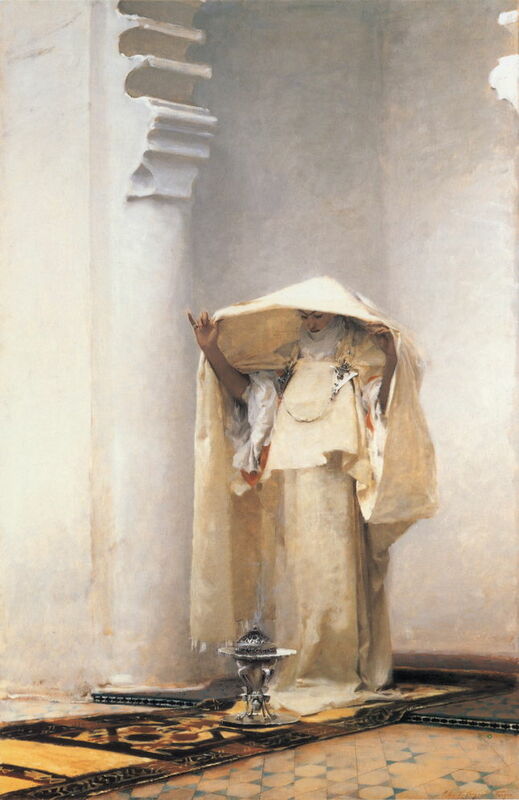 John Singer Sargent, Fumée d’ambre gris (Smoke of Ambergris) (1880), oil on canvas, 139.1 x 90.6 cm, Sterline and Francine Clark Art Institute, Williamstown, MA. WikiArt. On his return to Paris, he was commissioned to undertake several portraits, launching his career to become the most sought-after portraitist in Europe. His outstanding painting of Madame Pierre Gautreau (Portrait of Madame X, 1884) brought scandal, though, and drove him to move to London. There critics were at first not as receptive as they had been in Paris. However his Carnation, Lily, Lily, Rose (1887) was very well received at the Royal Academy, and immediately purchased by the Tate Gallery. 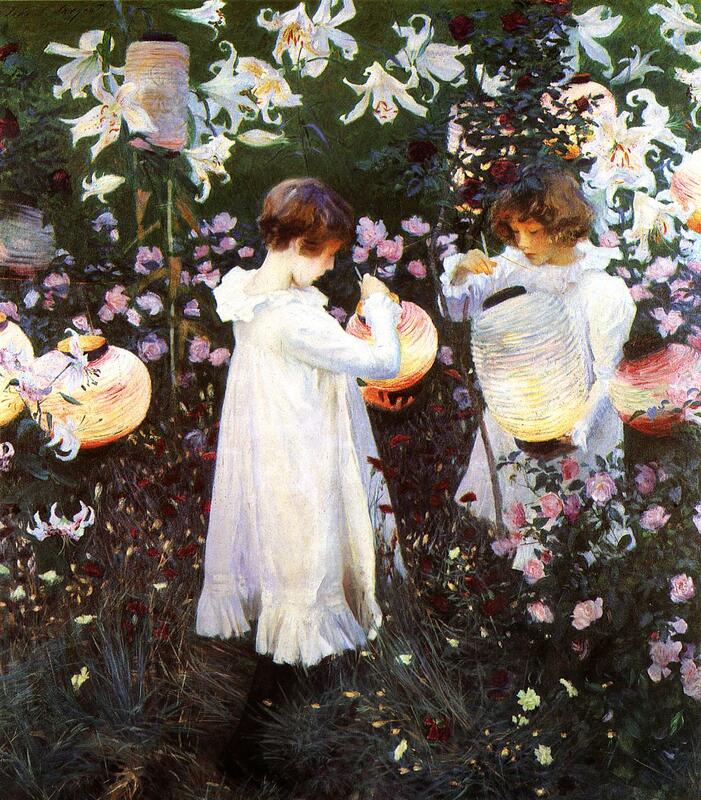 John Singer Sargent, Carnation, Lily, Lily, Rose (1885-6), oil on canvas, 174 x 153.7 cm, The Tate Gallery, London. WikiArt. During the 1880s he painted realist portraits, but his uncommissioned work often took him plein air and with progressively loosening style. He visited France frequently, attending the Impressionist exhibitions, and developing his friendship with Monet. His informal works were often very loose bravura gatherings of marks, which appear to have been painted very quickly indeed. 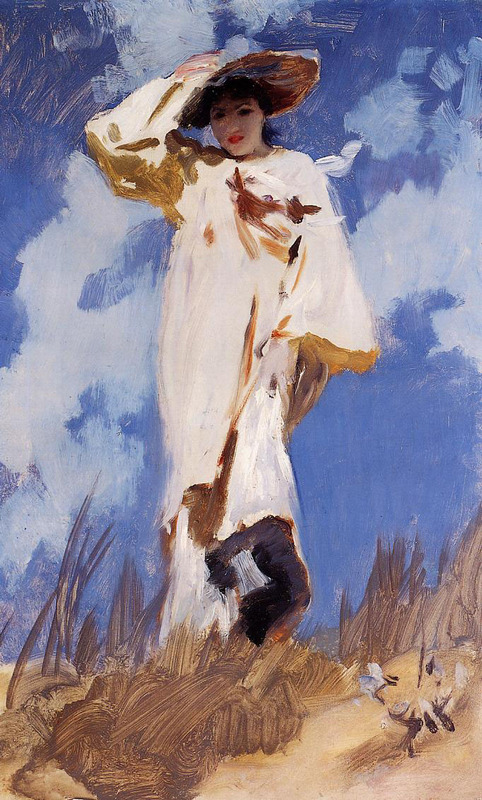 John Singer Sargent, A Gust of Wind (c 1886-7), oil on canvas, 61.6 x 38.1 cm, Private collection. WikiArt. By the end of the 1880s, in England his critics considered him an Impressionist, but Monet considered that he was still under too much influence of Carolus-Duran to be considered Impressionist. His portrait business prospered: in 1887-8 he toured the US and gained over twenty important commissions, including that of Isabella Stewart Gardner, a major patron of the arts in Boston. Whilst there, in Boston, 22 of his paintings were shown in his first solo exhibition. 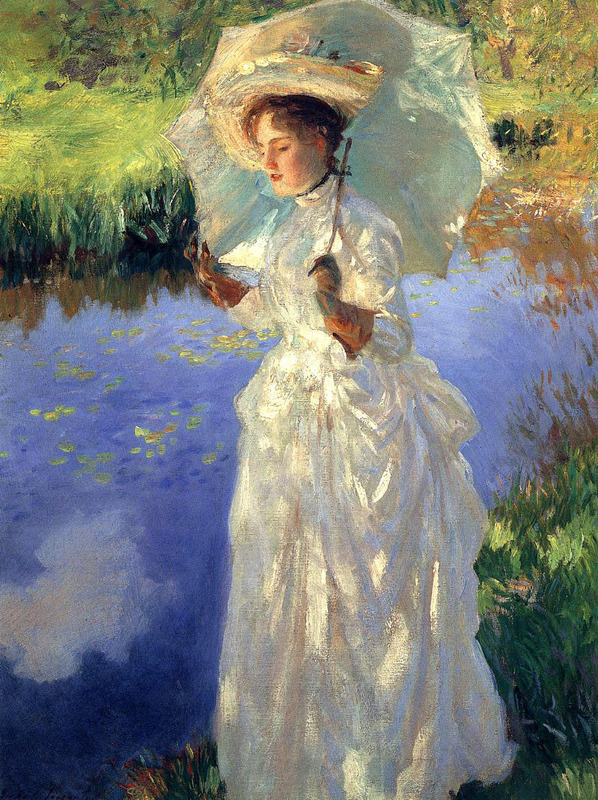 John Singer Sargent, La Carmencita (1890), oil on canvas, 54 x 35 cm, Private collection. WikiArt. Demand for his portraiture skills remained high during the 1890s, and he had limited time for uncommissioned and more personal painting. However his portrait style tended more towards bravura. From 1900 he spent more time travelling, and officially closed his studio in 1907. 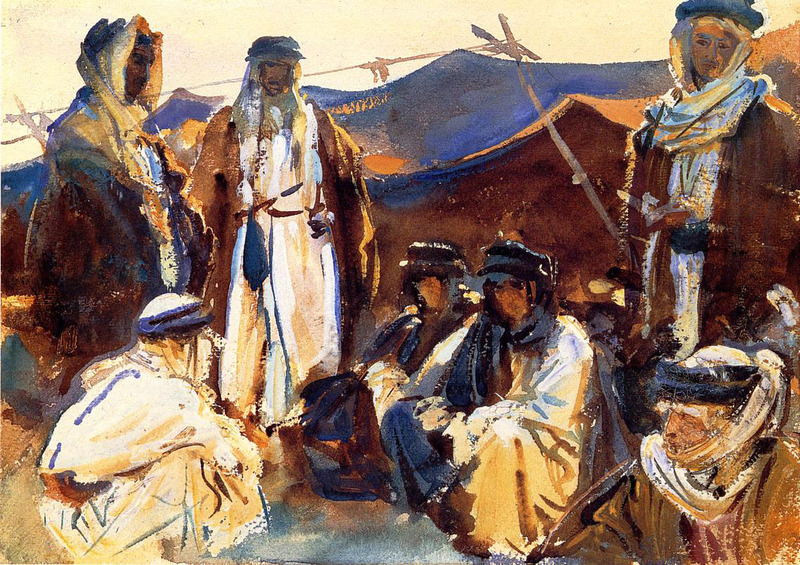 John Singer Sargent, Scuola di San Rocco (c 1903), watercolour on paper, 35.6 x 50.8 cm, Private collection. WikiArt. 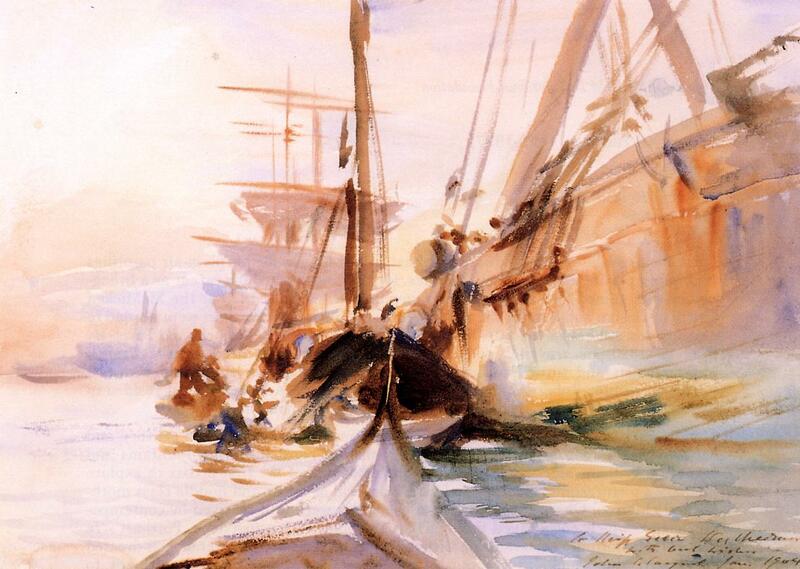 John Singer Sargent, Unloading Boats in Venice (1904), watercolour on paper, 25.4 x 35.3 cm, Private collection. WikiArt. 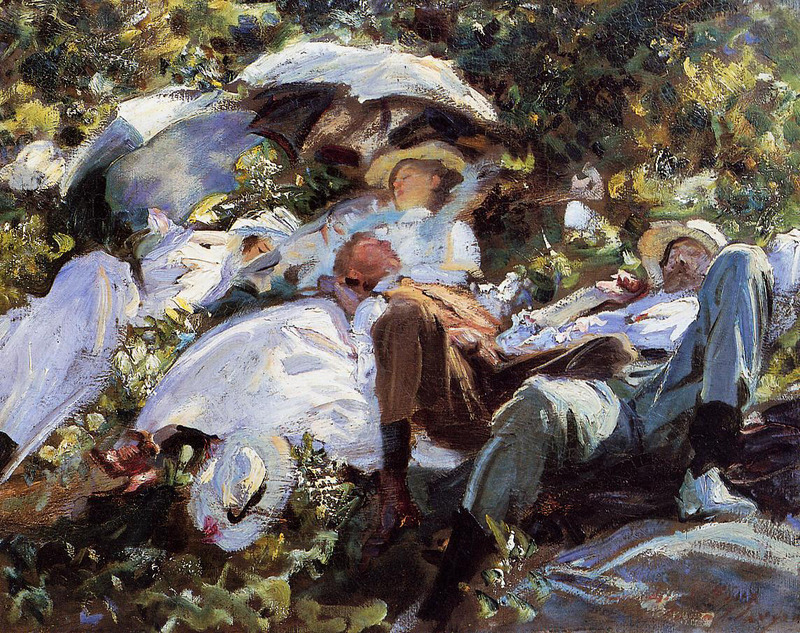 John Singer Sargent, Group with Parasols (A Siesta) (c 1905), oil on canvas, 55.2 x 70.8 cm, Private collection (sold in 2004 for $23.5 million). WikiArt. 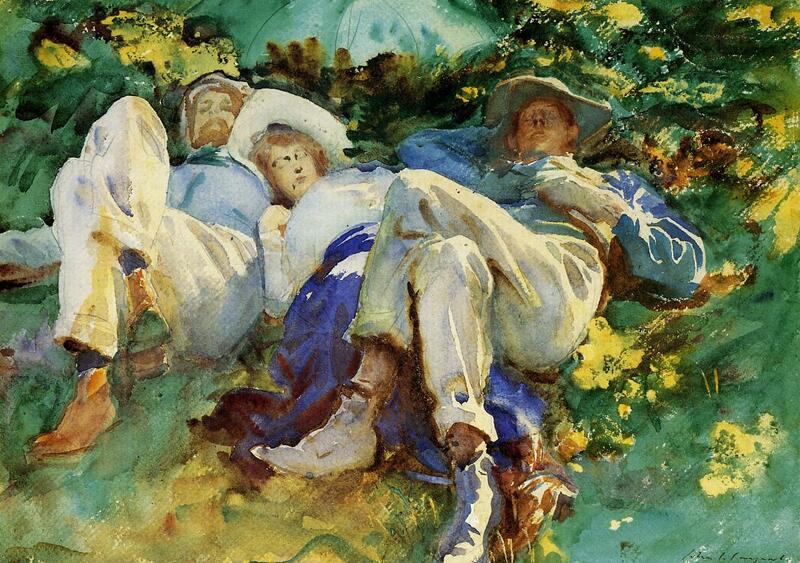 John Singer Sargent, Siesta (1905), watercolour, gouache and pencil on paper, dimensions not known, Private collection. WikiArt. This finally afforded him the time to concentrate on architectural and landscape painting, particularly virtuoso plein air sketches in oils and watercolours. He was offered a British kinghthood, but declined it, retaining US citizenship. He was openly critical of modern artistic movements such as Cubism, for which prominent critics such as Roger Fry were scathingly critical of Sargent, alleging that he lacked artistic merit. 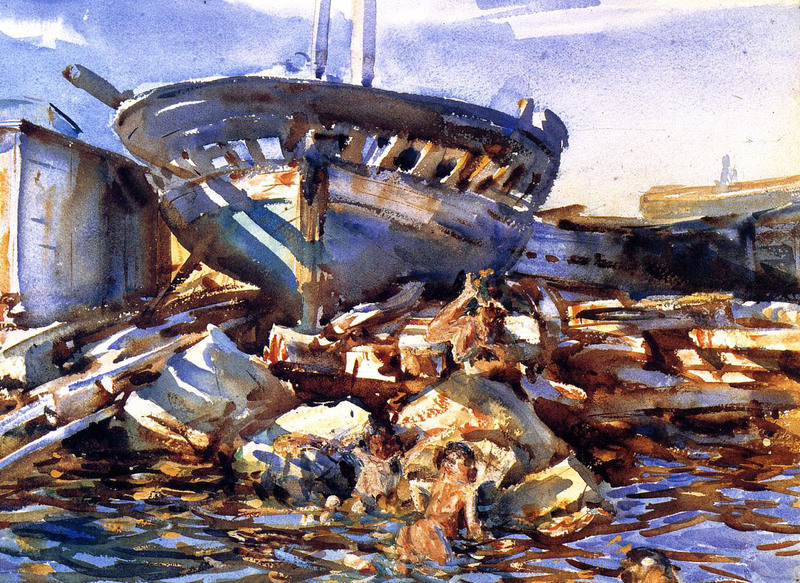 John Singer Sargent, Flotsam and Jetsam (1908), watercolour on paper, 34.6 x 47.3 cm, Portland Museum of Art, Portland, Maine. WikiArt. 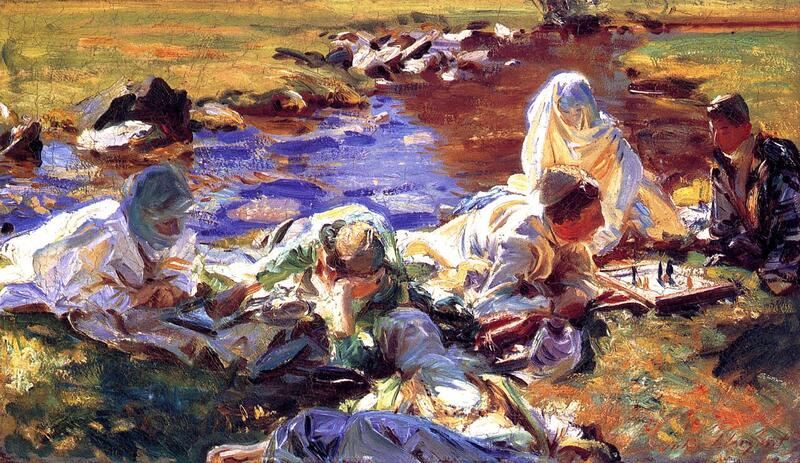 John Singer Sargent, Simplon Pass. 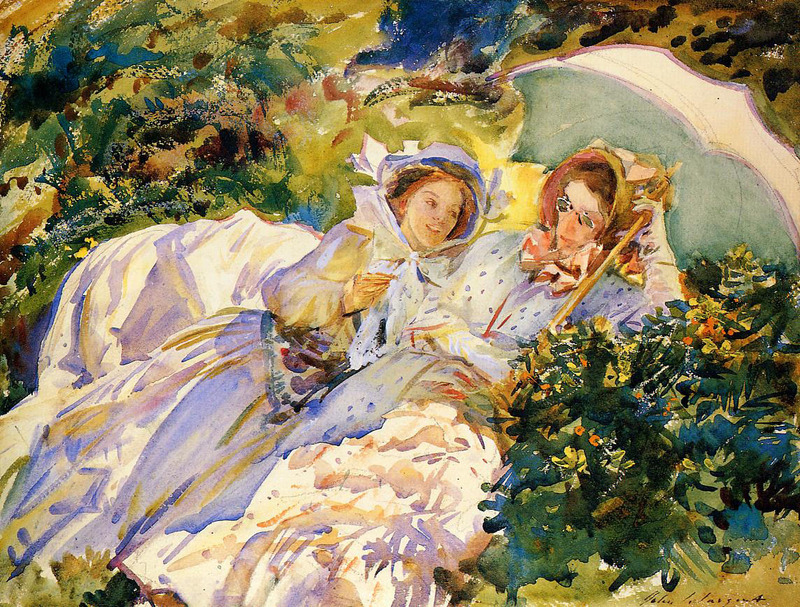 The Tease (1911), watercolour on paper, 40 x 52.4 cm, Museum of Fine Arts, Boston. WikiArt. 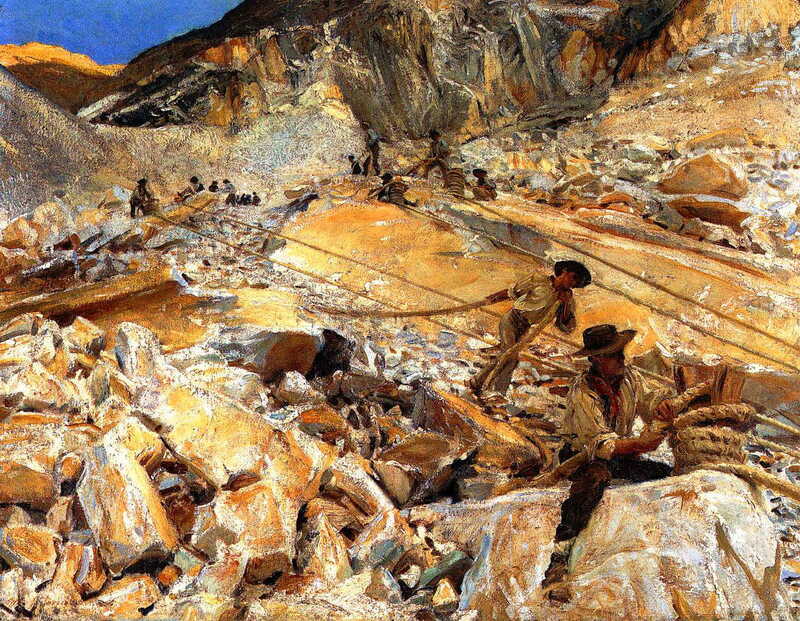 John Singer Sargent, Bringing Down Marble from the Quarries in Carrara (1911), oil on canvas, 71.5 x 91.8 cm, Metropolitan Museum of Art, New York, NY. WikiArt. John Singer Sargent, San Vigilio, Lake Garda (1913), oil on canvas, 72.1 x 183.8 cm, Lord Beaverbrook Art Gallery, New Brunswick, Canada. WikiArt. Sargent completed several murals in the Boston and Cambridge, MA, areas, and those in the Boston Public Library are his largest works. These occupied periods between 1895 and 1919. At the end of the First World War he was commissioned as an official British War Artist, completing one of the best-known paintings depicting that war, Gassed (1919). 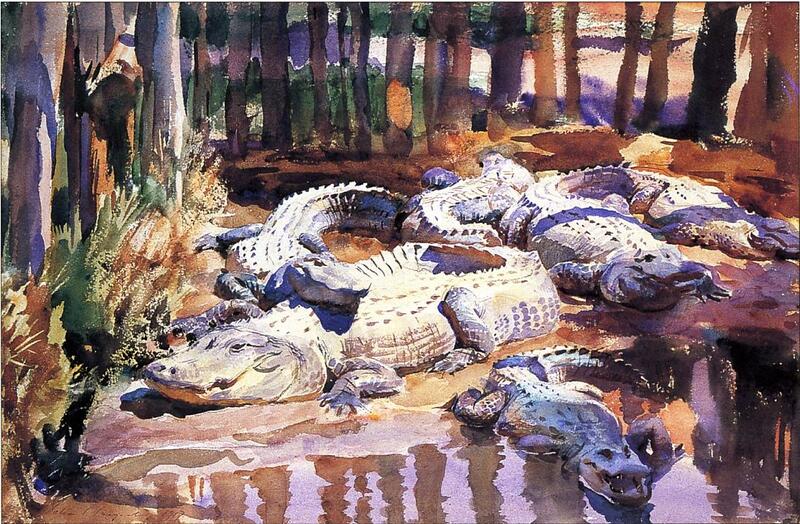 John Singer Sargent, Muddy Alligators (1917), watercolour and graphite on paper, 35.5 x 53 cm, Worcester Art Museum, Worcester, MA. WikiArt. 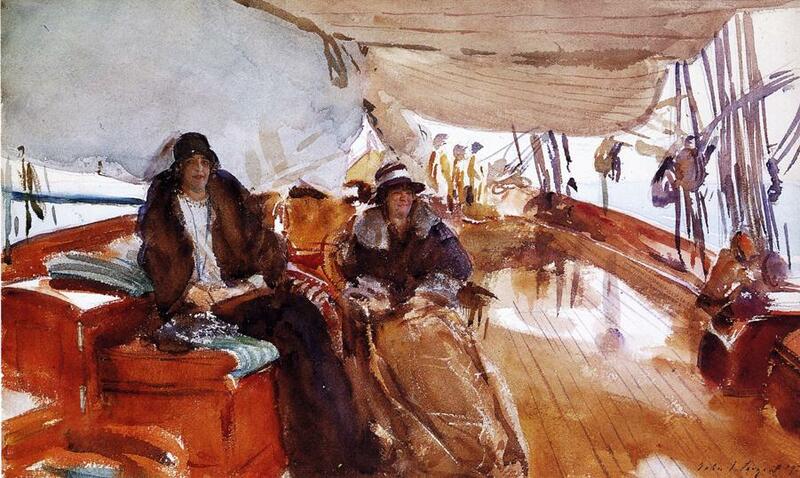 John Singer Sargent, Rainy Day on the Deck of the Yacht Constellation (1924), watercolour on paper, 33.6 x 53.3 cm, Private collection. WikiArt. In 1922 he co-founded the Grand Central Art Galleries in New York, and in his later years taught at their academy, the Grand Central School of Art. He died on 14 April 1925, having painted nearly a thousand works in oils, and over 2000 in watercolours. He was honoured in memorial exhibitions in Boston, New York, and London, but by the 1930s was dismissed as “an illustrator” and cynically superficial. It was only in the 1950s and 60s that his reputation started to grow again. 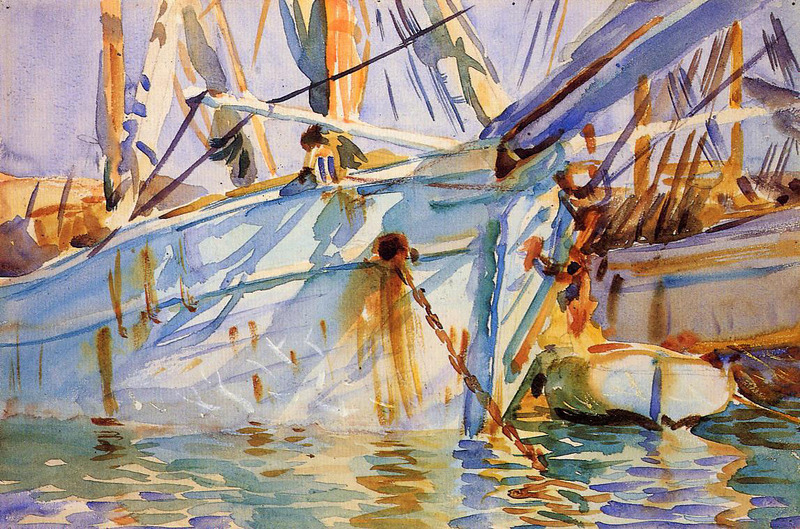 Whether Sargent was ever a true Impressionist will remain a matter of debate. 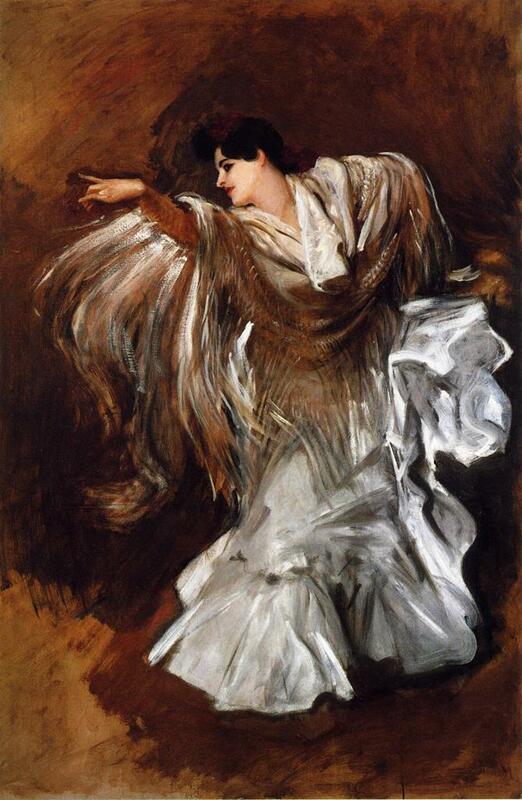 Like Boldini, Zorn and others, his commercial portraits retained sufficient realism to please the clients. It was in his uncommissioned work, particularly informal paintings of his friends at leisure and his travel landscapes, that his brushstrokes were at their loosest and most expressive, and his capture of the effects of light, and of rich colour, was most prominent. I think that they were truly impressionist, albeit in his own unique way. Ormond R and Kilmurrary E (2012) John Singer Sargent. Figures and Landscapes, 1900-1907. Complete Paintings, volume VII, Yale UP. ISBN 978 0 300 17736 0. Ormond R and Kilmurrary E (2014) John Singer Sargent. Figures and Landscapes, 1908-1913. Complete Paintings, volume VIII, Yale UP. ISBN 978 0 300 17736 7. Posted in Painting and tagged Boldini, Carolus-Duran, Fry, Impressionism, Monet, Sargent, Weir, Zorn. Bookmark the permalink.